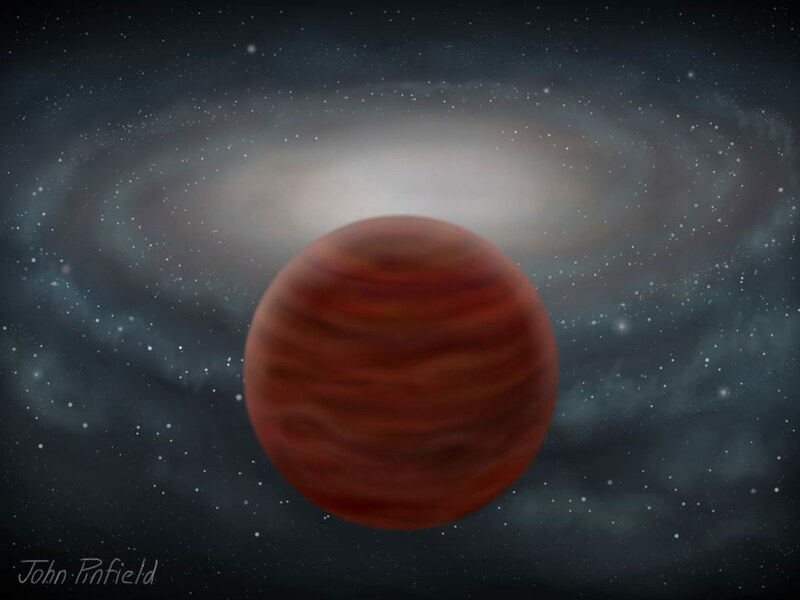 A brown dwarf from the thick-disk or halo is shown. Although astronomers observe these objects as they pass near to the solar system, they spend much of their time away from the busiest part of the Galaxy, and the Milky Way’s disk can be seen in the background. Credit: John Pinfield. In a newly published study, astronomers detail the discovery of two ancient brown dwarfs that are moving at speeds of 100-200 kilometers per second. A team of astronomers led by Dr David Pinfield at the University of Hertfordshire have discovered two of the oldest brown dwarfs in the Galaxy. These ancient objects are moving at speeds of 100-200 kilometers per second, much faster than normal stars and other brown dwarfs and are thought to have formed when the Galaxy was very young, more than 10 billion years ago. Intriguingly the scientists believe they could be part of a vast and previously unseen population of objects. The researchers published their results in the Oxford University Press journal Monthly Notices of the Royal Astronomical Society. Brown dwarfs are star-like objects but are much less massive (with less than 7% of the Sun’s mass), and do not generate internal heat through nuclear fusion like stars. 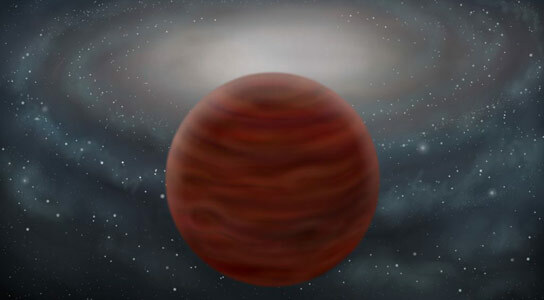 Because of this brown dwarfs simply cool and fade with time and very old brown dwarfs become very cool indeed – the new discoveries have temperatures of 250-600 degrees Celsius, much cooler than stars (in comparison the Sun has a surface temperature of 5600 degrees Celsius). Pinfield’s team identified the new objects in the survey made by the Wide-field Infrared Survey Explorer (WISE), a NASA observatory that scanned the mid-infrared sky from orbit in 2010 and 2011. The object names are WISE 0013+0634 and WISE 0833+0052, and they lie in the Pisces and Hydra constellations respectively. Additional measurements confirming the nature of the objects came from large ground-based telescopes (Magellan, Gemini, VISTA and UKIRT). The infrared sky is full of faint red sources, including reddened stars, faint background galaxies (large distances from our own Milky Way) and nebulous gas and dust. Identifying cool brown dwarfs in amongst this messy mixture is akin to finding needles in a haystack. But Pinfield’s team developed a new method that takes advantage of the way in which WISE scans the sky multiple times. This allowed them to identify cool brown dwarfs that were fainter than other searches had revealed. The team of scientists then studied the infrared light emitted from these objects, which are unusual compared to typical slower moving brown dwarfs. The spectral signatures of their light reflects their ancient atmospheres, which are almost entirely made up of hydrogen rather than having the more abundant heavier elements seen in younger stars. Pinfield comments on their venerable ages and high speeds, “Unlike in other walks of life, the Galaxy’s oldest members move much faster than its younger population”. Stars near to the Sun (in the so-called local volume) are made up of 3 overlapping populations – the thin disk, the thick disk and the halo. The thick disk is much older than the thin disk, and its stars move up and down at a higher velocity. Both these disk components sit within the halo that contains the remnants of the first stars that formed in the Galaxy. 2 Comments on "Astronomers Discover Two Ancient Brown Dwarfs Moving at Speeds of 100-200 Kilometers Per Second"
“100-200 kilometers per second” relative to what? “100-200 km/s” is the instantaneous velocity of rotation around the dwarfs’ star. To put this into perspective, the earth’s instantaneous velocity around the sun is about 30 km/s, which means that these dwarfs’ travel 3-6 times faster than the earth does around the sun.